So I've been talking a lot about Bitfinex recently, since I started using it about 2 weeks ago. Up until now, I've been using a variety of exchanges including Bitstamp and BTC-E to trade my Bitcoin. I just want to point out that there is a big distinction between exchanges, and trading platforms like Bitfinex. On exchanges, all I could do was sell Bitcoin at a high, and buy them back at a low, or hold some USD in the hopes of snatching up some cheap Bitcoin. In fact, I'm sure all of you reading this have been trying to do exactly that for the last few months. If you haven't heard of Margin trading, get ready to be blown away; you'll be kicking yourself for not doing so earlier. When I first started trading on Bitfinex, I was totally tripping out about how I didn't find out about this platform and trade on it earlier. Trust me, when you start using Bitfinex to Margin Trade, you'll be wondering wtf you've been doing on those exchanges for the last few months. Because that's exactly how I felt, and that's also why I'm so excited to share it with you. Since then, quite a few people have been asking me on Twitter to cover some Margin Trading and Bitfinex trading material. So here goes nothing. DISCLAIMER: As much as I like Bitfinex and recommend them for Trading, I do not endorse the site in any way. I do not know if they'll close down today, tomorrow, or a year from now. I also do not know how they handle their funds internally and whether that will pose a problem in the near future. Please trade with caution, and only use money you can afford to lose. If you hear anything negative (e.g. withdrawl issues etc.) about Bitfinex on Reddit/Bitcointalk/Twitter, please make sure to let me know too! @Vinnigar1 Yes understand. My point is, you can do what you're already doing, but BETTER, with Bitfinex. You must be wondering, first of all, what exactly is Margin Trading? In a nutshell, margin trading is basically borrowing money from the broker (trading site) for trading. Bitfinex currently offers a leverage of 1:1 up to 2.5:1, meaning that you can borrow 1 up to 2.5 Bitcoin for every 1 Bitcoin deposited. For beginner traders, I suggest changing your leverage right after you set up you account to 1:1. Keep in mind that by borrowing funds, you'll be subjected to interest charges (10-13%) which is automatically factored in when you close your position. If you're inexperienced, please listen to my advice, or you could get burnt badly (although 2.5 leverage is pretty decent). For example, if you use 2.5:1 leverage, and short sell your whole account from $800, but price goes up by $800/2.5=$320 to $1120, you're going to lose ALL your Bitcoin in your account (even lower than that actually, because of a platform's stop-out level and margin call). Of course, this can be easily managed with a good trade size & risk management strategy, which I will cover later. 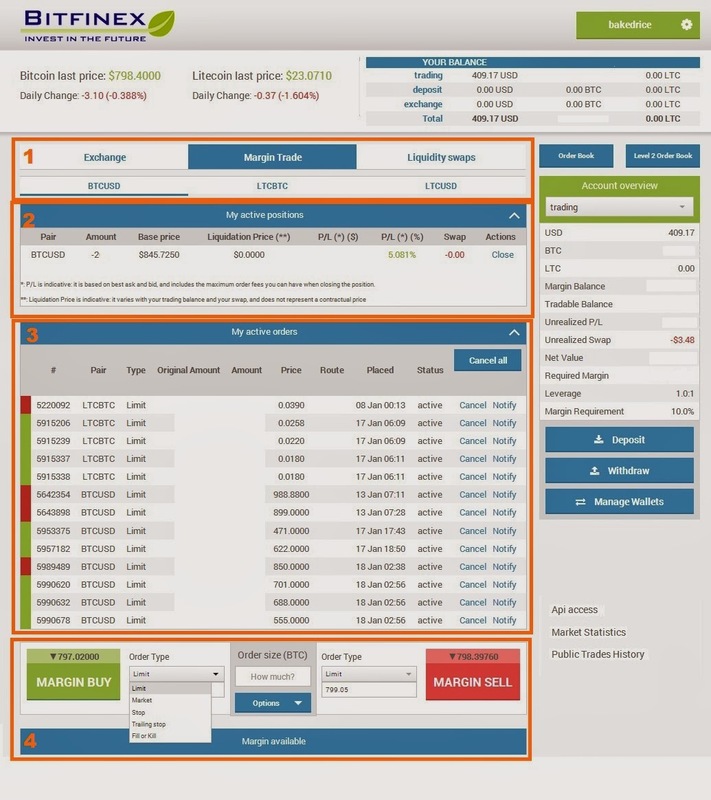 There are 3 options to choose from on Bitfinex; Exchange, Margin Trade, and Liquidity Swaps. If you head to their 'how it works' page, you'll be able to find a good explaination of each of the 3 different functions available. More importantly, I will only focus on Margin Trading, because that's all you'll need to get started on Bitcoin/Litecoin trading. What is Margin Trading? Abstract from Bitfinex. Let me just orientate you the site before we go on further. Once you create your Bitfinex account, you'll arrive at this page as you see below. So first of all, click on Margin Trade, and select the currency pair that you would like to trade. Secondly, you can see your active positions held, for example I have a sell order (indicated by the '-' sign) at a price of $845, and I'm making ~5% on my trade at the time of posting. You can also see a 'close' action available, which allows you to close your position at the current market price. Thirdly, you can see some of my active orders; red is sell, and green is buy. I have already set 5 different buy positions on $BTCUSD at $701, $688, $622, $555, $471, and 3 sells at $850, $899, and $988. You can see already, that there's much more room to play around with trading on Bitfinex as compared to a traditional exchange. And lastly, the 4th section is where you place your orders. There's 5 different kinds of order types, namely Limit, Market, Stop, Trailing Stop, and Fill or Kill. Do read the links provided for an explaination of each different order type. So what we'll focus on here is how to actually place orders, and how to manage your orders on Bitfinex. For more about technical analysis and an introduction to trading strategies, visit my previous blog post here. If you're thinking of starting out on trading, I highly advice reading the linked article, as well as this set of very good resources by Reddit user ClydeMachine. Let's say we deposit 10 Bitcoins into Bitfinex for trading, and we think that the general trend is going down, and want to place a short sell to capitalize on the fall. 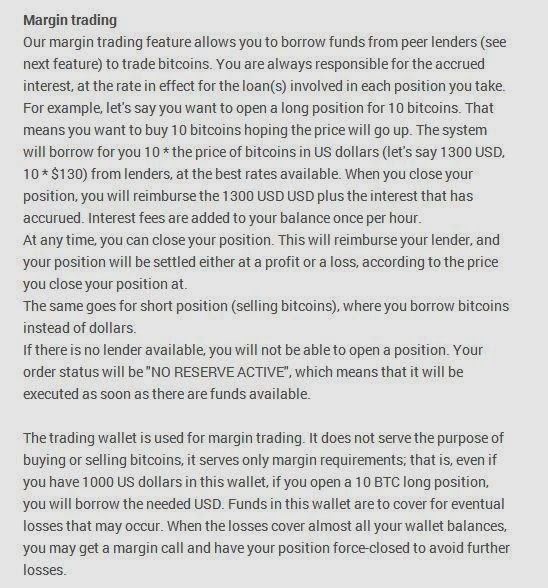 You'll place a Limit Order, enter your price say $850, for a total of 1 Bitcoin, and click the Margin Sell button. Let's also say from Technical Analysis you figure out that the next support levels are at $760, and $700. So at the same time, you can also place a Limit Buy order for something like 0.5 BTC at $760, and 0.5 BTC at $700. On top of that, if you think that there's a strong resistance at $900 and feel that it may break up to $900 but not beyond that, you can also place a Stop Buy Order at $910, or a Trailing Stop Order for $60 (provided it's currently $850, it will add on the market price -- they both work the same way, only different in the way the position is entered). And if you're going long (buying because you think the market is bullish), it'll be the exact opposite of a short sell as mentioned above. When your $850 sell order is reached, it will then appear on your Active Orders (section 2) list. From there, if the price moves in your favour, and reaches $700, you'll make 0.5*($850-$760) + 0.5*($850-$700) for a total profit of $120. Point to note is that your Limit orders will cancel each other out. On the other hand if market moves against your favour, and completes your Stop or Trailing stop orders at $910, you'll lose $60 on your trade. With regard to choosing a suitable leverage for yourself, this is really up to your own personal risk preference, as well as how much you have to trade with. If you have more BTC to play around with, you can choose to deposit more and use a low leverage, unless of course you're in the mood to gamble. But again, please trade safe. This more or less covers Bitcoin trading on Bitfinex. Sign up with me and get 10% off your trading fees for 30 days here. If you have more questions, feel free to tweet me @onemanatatime. With that, I just want to also cover some of the basics of Bitcoin Trading and share what I think are the most important tips for you traders out there. If you're thinking, why should you listen to me; I have to be honest and say that I've only been trading Bitcoin since September 2013, although I have some experience from Forex Automated Trading since November 2012. On the other hand, since making my first few mistakes trading, I've been putting a lot of effort into researching the topic, and I believe I have a pretty good fundamental understanding of the Bitcoin market. I like to think that I learn pretty fast, but who knows, I could just be getting lucky. Either way, I've made a few pretty good predictions since early December 2013, and I'm just here to help all of you who are interested to learn more. As mentioned right at the start, one of the most important traits of a good trader is to be disciplined in your trade sizes and plan a risk management strategy that suits your risk-propensity and style. Before you dismiss the importance of this statement, I just want to add that I've been playing poker for over 5 years, and I know how important money management is in being successful as a poker player; and trading is no different. In Equities/Forex trading, traders typically risk 1-2% of their whole portfolio on any single trade. On the other hand, I understand that this % is wayyyy too small for any of you reading this (all you gamblers...). I'll just point out that I typically risk about 10% of my whole portfolio on each position, and up to 50% for active trades. If Bitcoin goes to $400-500 within the next 4 weeks, I'll be sure to be going all-in on a long position. Secondly, the markets are ever evolving. Don't rely on static indicators or use past price-actions as a judgement of the future. Bitcoin is a largely free-floating market with no party controlling it per say (although you can argue that governments can manipulate prices, such as China's ban), and as such the price is truly an average price based on the sentiment of market participants. What comes as a surprise to me, is that there is still a very large uncertainty among the general adopter of bitcoin regarding its future potential. As such, we're currently seeing the tanking/falling of price I have been predicting for a week. On the other hand, any critical news (government level more than anything else) can affect Bitcoin price drastically and we'll have to see how China acts over the next weeks. I personally believe we'll see a last dip, before prices start climbing up, and finally breaking $1200 around March or April (start of the financial year, and we'll see huge businesses follow Overstock's lead, as well as investor and Wall St $$ pour into Bitcoin) this year and we'll probably see the start of the next bubble. In fact, I would make another bold prediction for 2014, that China will reverse this current ban. Things are heating up, and will get crazy. This time, be smart! Lastly, plan your trades well! Don't jump into a trade without having planned out not just your entry position, but your exit plan (stop loss) as well as your target price. If you can't determine either one, wait for a better setup! Always look for a setup where you have a higher reward to risk ratio, of at least 2:1. Meaning that your stop loss is $50 away, while your take profit is $100 away. How do you judge price levels / How do you do Technical Analysis? First of all, please take TA only as a supplement to fundmental analysis, and more importantly with general market sentiment and psychology. For now, all I use is Fibonacci, and some basic resistance/support based on previous price-action. Nothing spectacular at all. As you can see, I'm not a very experienced trader, and really don't pay much attention to TA (but it helps, although too much TA is not good either). That's why I prefer to use a crystal ball. Why do you think price is going down now? I think news is factored in by the time you hear about it (more or less), and this only becomes more true as time goes on. It is more important to look at the market as a whole, from a bird's eye view. Think about the psychology of the market. For example, currently markets are bearish (since the huge drop 5th December 2013, coupled with a lower low on the 18th Dec, and a double top at around $1000) and many are uncertain of how China is going to act moving forward, and hence are generally uncertain about Bitcoin's future. We'll need some big news for prices to start climbing up again, but that'll just be a matter of time. I have lost a bunch of coins in the past from stupid trades. I have lost confidence in trading. Learn to manage your trades & crypto portfolio. My general guideline to everyone is to keep at least 50% in BTC/LTC and largely for the long haul, maybe about 20-30% for trading, and use the rest for your favourite Altcoins. Altcoin prices are highly volatile, and when prices of Bitcoin fall, you'll see that Altcoins fall much much harder. On the other hand, when Bitcoin goes up, you'll see Altcoins climb much faster. Considering that, now'd be a perfect time to stock up on cheap altcoins until Bitcoin starts climbing again. I (think I) believe in Bitcoin's future. Should I be worried about the price dropping? If you really believe in Bitcoin's future, gather as much FIAT as you can right now and buy your Bitcoin while we still have prices under $850. We probably won't be seeing such prices again once Bitcoin starts to skyrocket past $1200, making the November 2013 bubble look like nothing; just think how the April 2013 bubble looked like in November. Oh, and Bitcoin is going to change the world. So there you go, I hope this post can help you get started on Bitcoin Margin Trading. If you haven't got your account by now, sign up with my referral code and enjoy 10% off your trading fees for the first 30 days. Click here to get started on Bitfinex. Lastly, I'm building a list of very strong Bitcoin traders on Twitter, and looking to find only the best thought leaders on the topic. Do check it out the Crypto Trading List and feel free to give any feedback or suggestions for who else should be in there. Also feel free to visit my TradingView profile where I chart out my Bitcoin (and some Litecoin soon) predictions. If you haven't watched this video by @ChrisDunnTV, highly recommend checking it out! Bitcoin Basics (Part 5) - "How To Make Money Trading Bitcoin"
I'm thinking of a few topics for my next blog post. Would you like to see something about Bitcoin Daytrading & Technical Analysis, a revisit & review of Altcoins, Poker & Daytrading, or something about Dogecoin? Drop a comment, send me a message with the form right at the bottom, or tweet me at @onemanatatime. I first dabbled with Trading and Technical Analysis back in November 2012, when I first got into Forex Trading. Back then, I was introduced to an Automated Forex Robot that could rake in passive income of about 5-10% a month, and used a Martingale (doubling) strategy for trading. In less than 3 months, half of my account went bust because I was using too high of a risk-reward setting, coupled with a highly volatile GBP/USD market on the 4th of January 2013. I did a fair share of Finance courses during my Business studies, and had a basic understanding of the Equity and Forex markets, and thought that I knew what I was doing. But oh was I so wrong! After this setback, I began to learn more about Technical Analysis to supplement my Auto Trading, and more importantly, to really understand what I was investing in. I continued using the Forex Robot for the next 10 months up till November 2013, as I began to shift out my funds into Bitcoin after finally turning a profit in August. Since then, I have been following Bitcoin more closely, and have been super interested in learning how to trade Bitcoin.
.@steveomarburg I would if I had more $$$. I'm ALL-IN #Bitcoin. Back when I was learning more about Forex trading, I went to Forex school at Babypips, and learnt some of the fundamentals of chart reading and trading, such as reading candles and trading concepts. Unfortunately, I dropped out somewhere through Elementary School, after they lost me with all kinds of different indicators I could not see the use for. On the other hand, I still do think Babypips is a fantastic resource, especially for beginners who are keen to learn how to trade and better understand the Bitcoin market. More recently, since I made my first few panic buys and sells and lost some Bitcoins trading, I have been picking up again on Technical Analysis and Trading strategies. I'm not an expert at this, and neither should you take my words as investment advice, but I'm here to share some of my thoughts on Bitcoin trading, and I hope it is of great help to you! If you have any questions, feel free to tweet me at @onemanatatime. If you're a beginner trader, first thing you should learn is to read charts. Chart patterns signal to traders that the price of a security is likely to move in one direction or another when the pattern is complete. I'd like to bring your attention three chart patterns that will appear very often. I also took the time to show you how these relate to Bitcoin trading with the charting tools I use on TradingView. Enjoy! If price pops past Top #1, we'll see an uptrend. If price doesn't pop up, we'll fall back down. Secondly, another analysis tool I think is very useful, is the Fibonacci Extension. Fibonacci is pretty tough to understand, and more so to chart with Bitcoin due to the lack of available tools which allow for it. But in essence, the Fibonacci sequence is a unique string of numbers which adds the sum of the two numbers before it, and is the deravitive of the Golden Ratio. People like to call them the "magic" numbers, and very aptly so, as they're present all throughout Nature. Lastly, I'd like to share a trading pattern called the Elliott Wave Principle. It emphasizes an understanding of Investor Psychology, and explains why prices fluctuate in zig-zag patterns. If you thought Fibonacci was tough to understand, let's have Babypips put this in perspective. Babypips teaches Fibonacci in Elementary school Grade 3, whereas Elliott Wave is taught in "Summer School". In that sense, Eliott Wave would be a great concept to learn and understand, as a supplement to your foundational understanding. Click on the links above to read and learn more about both theories! By now, you'd probably be saying: "Sure, these resources all give me a good basic understanding of trading markets, but how does that apply to Bitcoin?" Since learning the fundamentals, I've been looking around for good resources to learn Bitcoin Trading from but with not much luck. Here I'll be sharing some handy videos to guide you on your Bitcoin trading journey. I didn't get around to learning proper Bitcoin trading strategies, until early December when I chanced upon Chris Dunn's first Bitcoin trading video and prediction. I watched @ChrisDunnTV's first Bitcoin prediction video on the 6th of December 2013, and the rest of his "How To Day Trade" 5 part series videos. Somehow, I had a gut feeling that he was the ONLY guy trading Bitcoin who actually knew what he was talking about. Another spot-on prediction as Bitcoin falls to $817 Bitstamp. "@ChrisDunnTV: Scaling into a short position for BTC - http://t.co/HpkdB6KnZL"
Since then, he's made and nailed 5 back-to-back Bitcoin predictions, each with 15-30% profit. Watch his last prediction play out with immaculate precision. Watch the video here: Incredible Live Bitcoin Trading! Made 15% on my Bitcoin "short sell" listening to @ChrisDunnTV's tip. If you're thinking of trading Bitcoin, don't forget to stop by! This is a long one, but here's another great video I highly recommend watching: 60 Minute Stock Trading Blueprint Webinar. If you liked his content, watch his other videos on his YouTube channel and follow him on twitter @ChrisDunnTV for the latest updates! Lastly, I also very much believe in Chris Dunn's trading perspective. I think more than analyzing news articles, or technical analysis, the most important aspect of trading is to understand the market sentiment. Hence, I also want to highlight how many Bitcoin traders are currently looking at certain time frames (e.g. in 12 hours from now) to determine a price for entry. I'd just like say that that's not going to work! Instead of narrow time frames, and random $ amounts; think about Price-Action, Resistance, and Support. Another piece of advice, is to match the Price-Action of both a long term-time period as well as a short-term one, when trying to make judgement calls. I personally use Bitcoinwisdom.com for reading a chart, and use anything from a 6h to 1d Time Interval for a long-term period, and anything from a 5m to 30m chart for short-term analysis.
.@supershares $777 or lower? who knows. 12h time frame is too narrow. think price action, resistance & support; not hours and $. My very first prediction about Bitcoin came in my first blog post about Bitcoin hitting $1000 by the end of 2013. I wrote the post on 14 November 2013, and you can read it here: Is the Bitcoin train ever turning back? $1000 by year end? Then on 28 November 2013, I wrote another blog post about an incoming Litecoin crash. 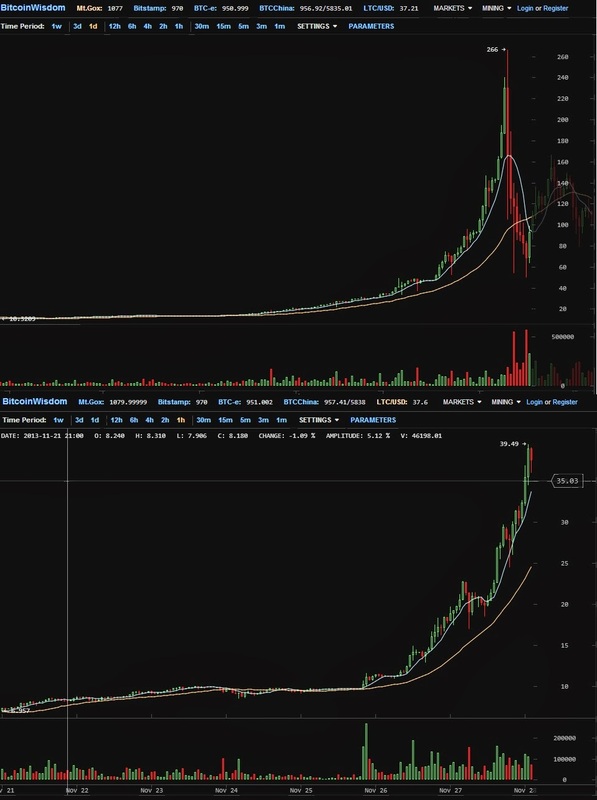 I related the price surge during that time, to the Bitcoin bubble of April's Cyprus fiasco. At that time, I had no clue how to judge resistance and support, but interestingly, the wisdom of crowds (more or less) pulled through with the right answer. Litecoin peaked at $50, before crashing down over 50%. Since I began learning to trade, the added market understanding has given me a better insight into estimating a fair price for altcoins, as well as to judge support/resistance levels to look for entry/exit points. I have made a few spot-on Altcoin predictions of my own over the last weeks, as you can see on my previous blog posts about WorldCoin, NXTcoin, and DogeCoin here and eMunie and EarthCoin here. Follow me on Twitter or my blog to get the latest updates on Altcoin opportunities! I think Bitcoin will be looking to retest the $544 support level of Bitstamp, before picking up for a new All Time High. But before we can go the Moon, Earth's gravity is causing a small nosedive into the $650-$720 levels, and I'll enter if my Sell order goes through at $850. Follow me on TradingView as I create new charts with Buy/Sell opportunities, or Twitter @onemanatatime for the latest updates! Don't forget to enter your vote for the Bitcoin price poll on the right column of this blog. Here's my vote, what's yours? With that, I'd like to end off with this; good luck trading, and HUAT AH! And here's a quote from The Alchemist, by Paulo Coelho.